Last visited by Zerver on Dec 18 98Rivendell is a city just South West of the city of Britain. 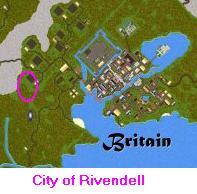 Some of Rivendell is even located IN Britain city limits. They feature the famous Hungry Halfling Tavern, many public houses, such as forges, bakery, tailor, training dens, etc. They also have many craftsmen and vendors. For newbies looking for help, or for experienced players looking for good items, they should be able to provide. I had a nice tour from F’ion Visca who showed me many of the buildings. Seems we could not take 10 steps without another citizen waving at F’ion. That makes for a very nice community.